I think there is a lot of overall messages in Brave New World. I think that the most important ones is that everyone being the same is not always good and that not being able to have real emotions, always being happy is sometimes not a good thing. Brave New World has made me have some realizations about happiness. In this book they are all happy except for one problem. They do not know what they are happy about although this happiness is a real emotion, not having anything to be happy about leaves something in the back of your head that keeps you from fully being %100 happy. I do not fully understand what he is saying but I think that it is saying that the way the people are living is affecting life so much that life does not seem as important. It is saying that life and civilization need to cost more and matter to the people more for at the moment it seems that all of the people in Brave New world do not value life at all. I think that about %75 or people focus on comfort. I think that truth and beauty have very different meanings most of the time. In some ways if truth and beauty are considered synonyms then maybe more like %50 of people are focused on that and the other half focused on comfort. A comment that was made by someone in my seminar was “It’s almost like we have our own soma in this word that is alcohol” I completely agree with this statement because when reading this book it seems like these people are just taking this drug to get away from their problems. We do the exact same thing, we drink to get away from our problems and this just made me realize that although our way of living and our technology and things are not the same there are definitely many things that are very similar between our world and Brave New World. I think that in this seminar I did fairly well on is relating the topics to stuff in the book and stuff in our world. In the past seminar I did a very terrible job in relating things to the book. In fact, I scored zero points on that section. This time I really did well in backing up everything I said by either facts in real life or facts and quotes in the book. My key take away from this overall reading and seminar is that everything and everyone has to keep changing and nobody can be the same for people to have real happiness. In the book everyone was happy but they kept talking about how the happiness was a “false feeling” therefor there actually is more happy people in our current world because the happiness that we have here is real supported happiness with actual reasons to be happy. 1. Danny has to wear a mask that hides his past and keeps him quiet and unnoticed. Uno has to wear a mask that makes him seem tough and emotionless to hide his soft personality and make other kids look up to him. 2. 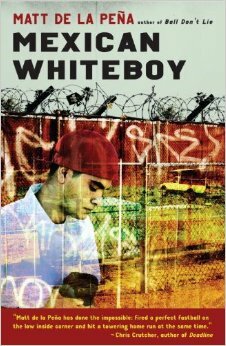 Mexican Whiteboy is a book about a boy who is mixed races so he never quite feels like he fits in. 3. It made me think about how mixed raced people do feel like they don’t fit in with one specific race. When TJ mentioned the thing about Danny having never seen white kids play stickball it really made me think about how much I agree with this. When my family would go to mexico we would go to a small island that was not a very touristic place. There were lots of kids who played stickball and talked about baseball but I never saw a baseball or a bat ever. I could really identify with this because of how much I had seen it. One of the main topics in our seminar was how the people in the book thought that because of their economic class and race that they would never get anywhere. In a song by J-cole (it has an inappropriate name) he raps about how most people at the top of their economic class it is because of their parents, their race and the place they lived. He also explains that he grew up in a bad neighborhood with bad parents but he tried as hard as he could and didn’t let his race or anything get in the way and now he is a rich man. I think that I did well on the personal opinion part of our seminar. The part that I think I need to improve on is finding quotes and evidence. I only used evidence two or three times in the whole seminar. “Even when you get old like your mom and dad. You’re still trying to figure out who the heck you are” I really like this line because it really puts it straightforward that your entire life you never really know exactly who you are and how you should act and how people never quite know how to fit in.